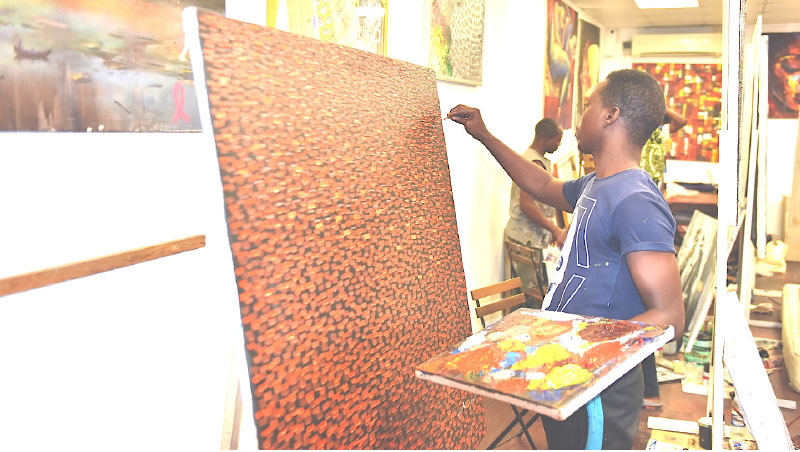 In a bid to develop African art through artists-in-residence programmes, Alexis Galleries recently graduated 15 up-and-coming artists from different parts of Nigeria to a two-week residency programme. The programme took place at the galleries on 282 Akin Olugbade Street, Off Idowu Martins Street, Victoria Island. The participating artists included Yemi Uthman, Adetunji Afeez, Agemo Francis, Oluwaseun Ojebiyi, David Olatunde, Joseph Bidemi, Ali Raheem, Babatunde Kesa, Samuel Olayombo, Oyelusi Olasunkanmi, Darlington A. Chukuwuze, Aidelokha A. Iziogba, Inumoh Charles, Aliu kabiru and Akinbanji Osanyemi. Founder and Director, Alexis Galleries, Mrs. Patty Chidiac-Mastrogiannis, said, “There is no artist-in-residence programme that is the same. Each artist has its own background and experience, thus, our residency programme is not just for the established, the up-and-coming, but mostly for the young artists. “During our first edition, we had six artists, while this edition boasts of 15. The programme offers space for creative minds to live and work with all expenses paid; free mentorship by established artists, professors and collectors who came around on daily basis to prick their creative consciousness so that they leave with fresh ideas and inspirations. “We give them room to explore, learn from one another and create artworks inspired by Naija, which is why the theme is “Simply Naija.” We also discover that there are many talented artists without a platform to showcase their talent; the programme provides such opportunity to them, thanks to Frigoglass, the bottling company that made it possible,” she explained. According to the curator, “Some of the works of this group of artists would be shown on the galleries to put them on a bigger scale. It will come under the theme ‘Destiny’. We also have another exhibition entitled ‘Fate’. So, you can see how fate runs with destiny. “This is a traveling show. The Artists-in-Residence would be shown twice a year in a group exhibition in October at Alexis, the National Museum, and other places,” she added. One of the artists, Aliu Kabiru Olatunji, who was working on apiece entitled “Broken Ladies”, explained that the theme was an image of broken mirrors inscribed with images of ladies, “It is a story of ladies who are denied opportunities in the country, and other parts of the world. I’m canvassing the need for women to be given opportunities to aspire alongside their male folks. It is regrettable that in Nigeria, women are broken in many ways,” he maintained.